No, they’re simply very reluctant participants and see no redeeming features in being clean: one puts on the brakes and suddenly weighs a ton whilst the other escapes to the backyard as soon he hears the sound of the running tap! Conner's first bath: not a fan then, not a fan now! Drying is a cinch even in winter with our short-coated Malinois, as they quickly shake off the excess water and then pace the deck in the sun, eagerly waiting to be let back in! However washing our double-coated Tervueren during the winter months is an ordeal. It takes him forever to dry and the look of pain on his face when water touches him has always been priceless! Taking them to our local dog wash is not an option: the closest is a fair way away and our pack is likely to be just as uncooperative and embarrassing! Thankfully we recently woke up to the fact that there are some dry shampoos which allow you to get your dogs clean and smelling fresh in no time whilst avoiding all the drama! 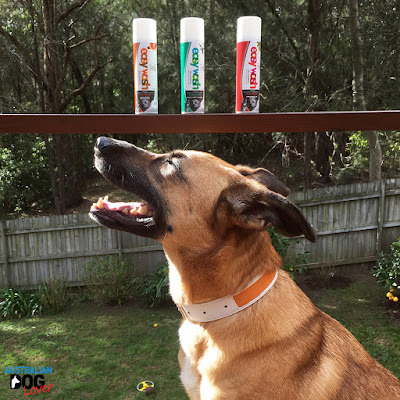 Joseph Lyddy is an Australian manufacturer of pet grooming products including shampoos, conditioners and detanglers but they also offer dog accessories (collars, leads and bowls) as well as dental treats and joint care chews. 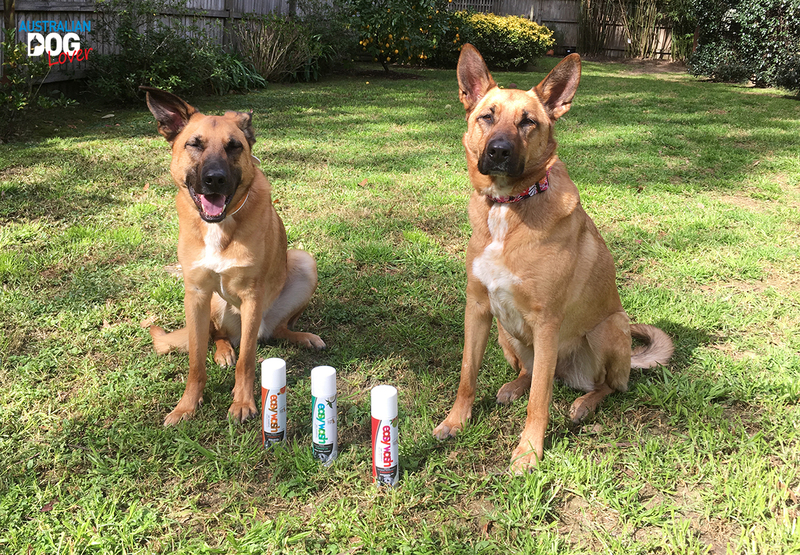 When the company suggested we trial their Easy Wash dry shampoos (part of the Pet Indulgence line) we were eager to accept and try anything that would make our collective bath experience less painful! All varieties contain only natural ingredients and are pH balanced and paraben free. They come in spray cans (200g) which should last you a long time. WHAT IS A DRY SHAMPOO AND HOW DOES IT WORK? It is a convenient and quick way to give your dog a clean-up without water. This means you don’t need to drag them to the bathroom or organise a tub and hose outside, and best of all you don’t have to deal with a soaking wet dog, as we usually end up just as wet! Dry shampoos are a great solution for in-between regular baths or when your dog needs a quick freshen-up for visitors or a trip to the vet! 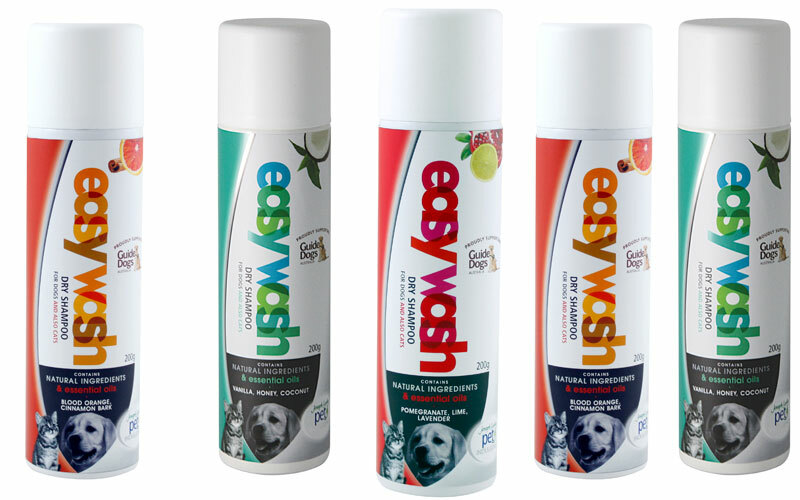 We are told that the Easy Wash range is also suitable for cats, who are possibly even less fond of water than our dogs! We decided to allocate one fragrance per dog in an attempt to choose our favourite at the end of our grooming session. I don’t know if Porthos understood this was his 'get out of jail card' and an alternative to being put in the bathtub but he could not shake the grin off his face! We gave him a couple of quick squirts on with the Blood Orange & Cinnamon Bark. Past the first moment of surprise, he settled in very well and thoroughly enjoyed the brushing process – we still use our old Kong Zoom Groom bought ten years ago, which always removes a huge amount of loose hair on all our dogs at bath time. Next in line was his sister Aramis and we thought the Vanilla, Honey & Coconut would be a bit more girly and appropriate for her! Again the first sprays came as a surprise to her - though we made sure we were not too close - but she decided that being the centre of attention was fun after all and ended up rolling on her back! Not so practical for a thorough refresh but at least she was relaxed! Smelling her coat afterwards, this fragrance was definitely our favourite out of the three we tried. 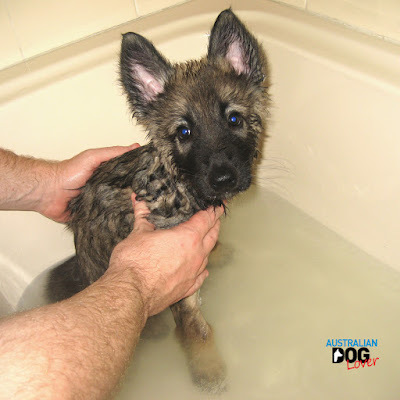 All our dogs had a proper bath in the three weeks prior so they were not very dirty to start with. So if your dog decides to jump into mud puddles or to roll in something “unmentionable”, I’d still head for the bathroom for a thorough soak and scrub! We were able to give our three dogs a quick refresh in under 15 minutes with no mess whilst keeping them happy throughout the process so this is one grooming session for the record books! The only negative is that the Easy Wash dry shampoos come in pressurised dispensers. They are therefore extremely flammable and must be kept in a cool place and away from direct sunlight. Don’t leave them in your car or exposed to temperatures over 50°C. 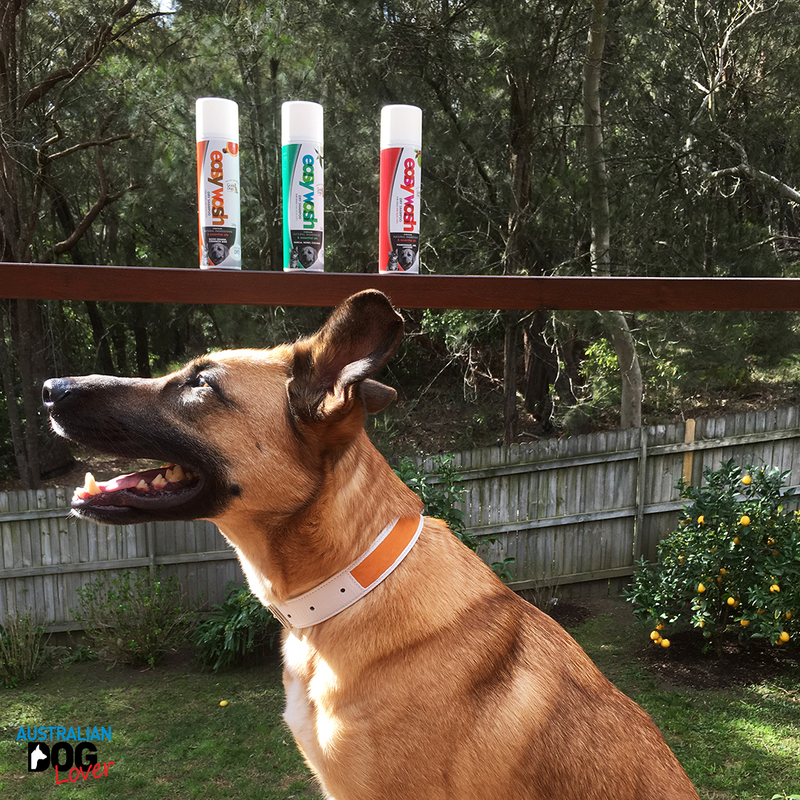 RRP: $12.95 (200g spray) available from Coles, Big W, Best Friends Super Pet Centres and other independent pet retailers.